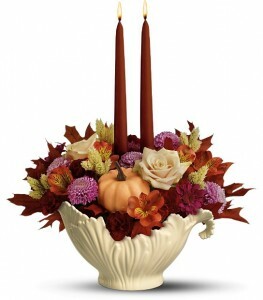 In addition to traditional centerpieces and cornucopia’s this year Blossom Basket Florist is featuring 3 autumn bouquets just in time for Thanksgiving. 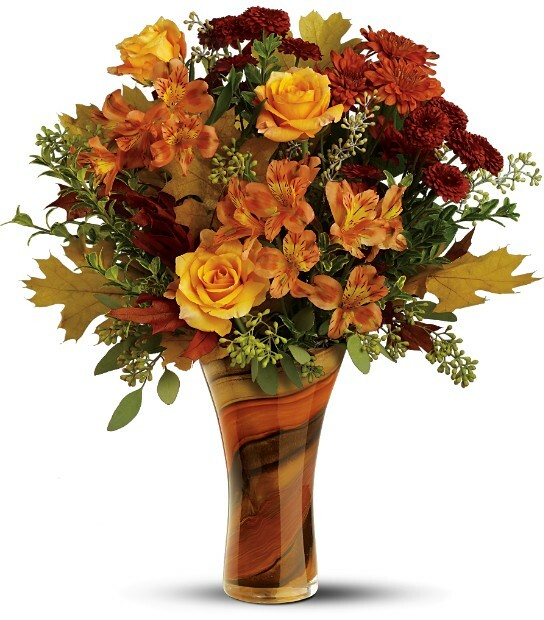 Spectacular is the word for this array of autumn flowers in a beautiful, hand-blown art-glass vase. Without flowers, it becomes a one-of-a-kind work of modern art. They’ll love it! 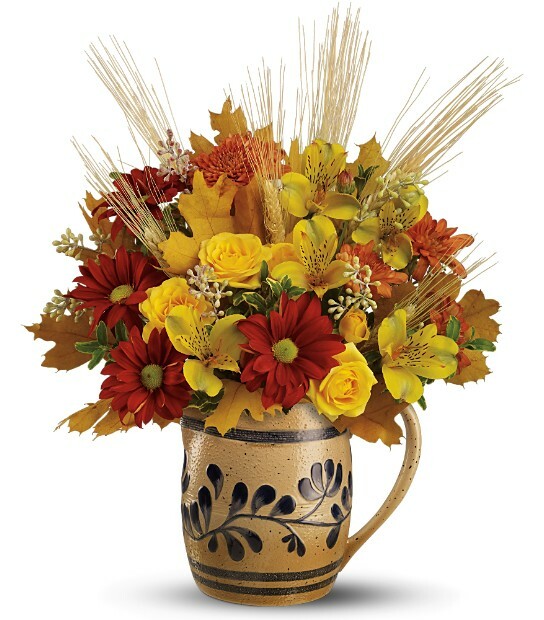 Bring the charm of Colonial Williamsburg to your celebration with a flurry of fall flowers in a delightful pitcher graced with a classic salt-glaze design. History can be heavenly. It’s hard to believe Thanksgiving is next week. This year has flown by so fast – the old adage “time flies when you are having fun” must be true! We have been blessed by our community and customers with the opportunity to serve them this past year. 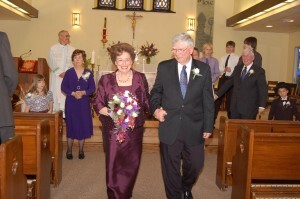 I just recieved pictures from two of our recent weddings. 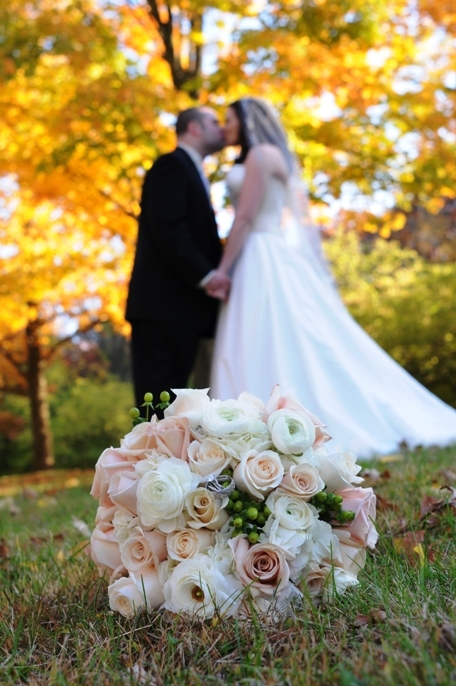 David Ghent was the photographer for each of these weddings and he has shared with us some beautiful images that feature the bouquets and arrangements we designed for these brides. His website http://www.ghentphoto.com/ features more of his beautiful photographs. He can be reached via email at dave@ghentphoto.com or via telephone at 217-649-7499. Thank you Dave for sharing your talent with us. 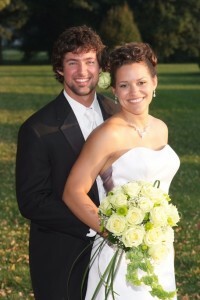 Dionne and Drew were married back in August. 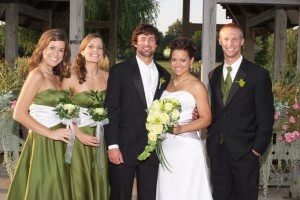 They had chosen a green color scheme for their wedding and immediately gravitated toward gren button mums (often called Kermits) and Jade Roses. Dionne was a big fan of gypsophila (other wise known as baby’s breath). We used these flowers in an asymetrical free form cascade for her bouquet adding bells of ireland and lily grass to elongate the drop of the cascade. The bridesmaids carried single rose clutches with lush greens and gypsophila while the men wore boutonnieres of green button mums and green hypericum berries. Elegant and sophisticated were the words Jessica used to describe the bouquet she wanted to carry down the aislefor her October 24th wedding. 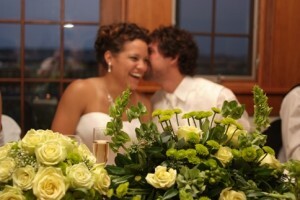 The bouquet we designed for her exceeded her expections. 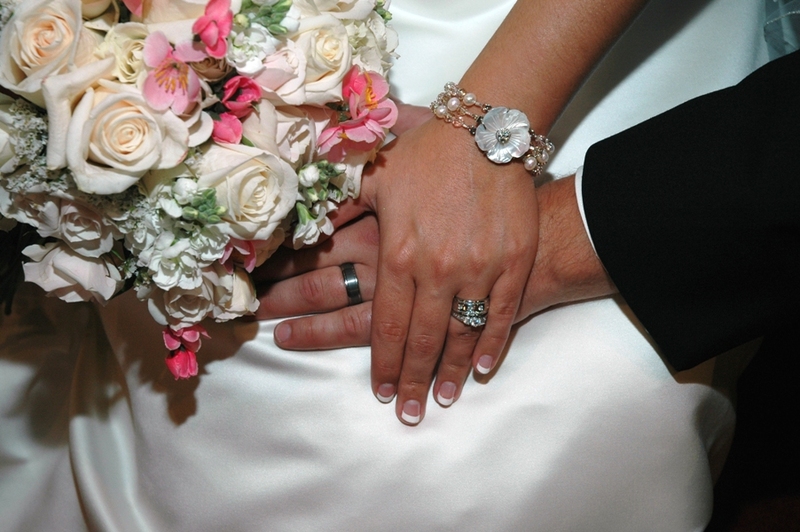 It featured Sahara roses in a warm taupe color to coordinate with the champagne accents of her dress. 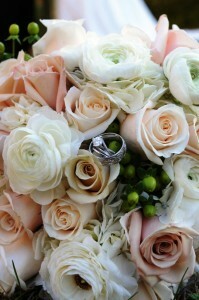 Creamy vendella roses added an ivory to the color pallette, with hydrangea and ranunculus contributing a bright white. Touches of green hypericum enriched the texture. I guess the pictures speak for themselves, but I’ll say it too – These wedding flowers were fun, bright and full of orchids. This prefectly matched the personality of the bride who was fun, bright, and full of energy. She came to our shop with a few ideas and after a few minutes found the bouquet of her dreams (see right) in a picture. 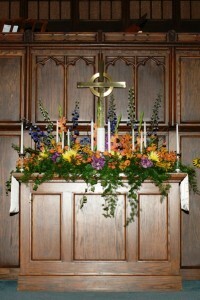 The alter arrangment incorporated the unity candle set and other tall taper candles in a stunning display. Thanks to Laura Rexroad of Moments Rememberd for letting us share these beautiful photographs with you. Galleries with more of her work, as well as contact info can be found at http://www.momentsrememberedphoto.com/. I know I say this alot but I really enjoyed working with this couple! Thank you for choosing Blossom Basket and giving us the opportunity to help you create the wedding of your dreams. 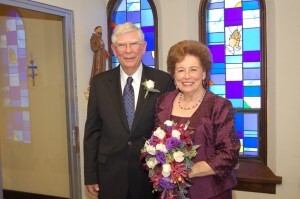 Thanks to the bride, JoAnn, for sharing pictures of her wedding ceremony. 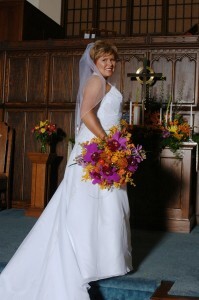 Her teardrop cascade bouquet was filled with deep shades of purple and creamy ivory. Lisianthus added a color pop of royal purple, wine toned orchids helped tie the color scheme to the fall season, and dark plum mini calla lilies contribute to the drama of the bouquet. 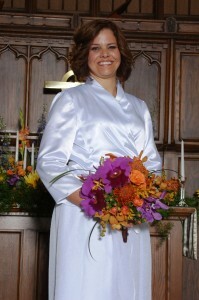 I love this picture almost as much as I loved working with this bride. 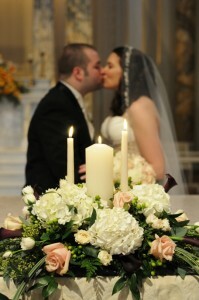 From our first meeting Hannah knew she wanted a soft romantic bouquet with accents of soft pink silk cherry blossoms. We accomplished this look with creamy vendella roses, antique ivory spray roses, white stock, and white limonium. 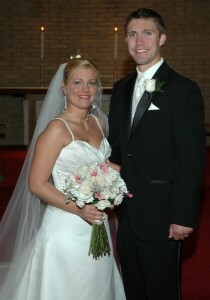 Beautiful images were provided and photographed by Jim Mikeworth, he can be reached at 217-832-9434.